Illuminating the cover of the May issue of G3 is a lake-dwelling filter feeder no more than a couple millimeters long. 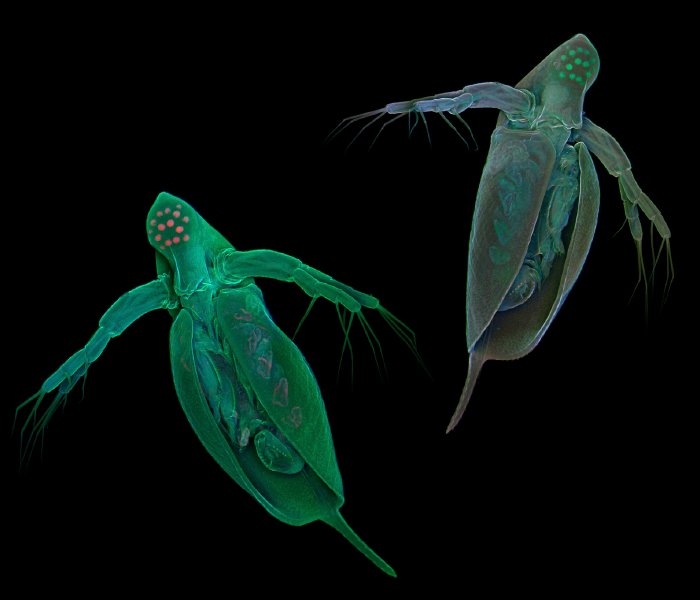 This microcrustacean—Daphnia pulex, also known as the water flea—is an important model organism, especially in ecological genetics. But despite Daphnia’s status as a model organism, no one had examined its population genomics until now. Four papers in GENETICS and G3 by Michael Lynch’s group delve into Daphnia’s population genomics. Although the Daphnia genome had been sequenced, Ye et al. provide a new reference genome assembly that bolsters the field and enhances the group’s three other papers. The new assembly also corrects the prior version; when the researchers compared the two assemblies, they found that the old version contained 7,000 false-positive genes. Lynch et al. report the first population genomic study of Daphnia and compare one population’s genomic structure to that of the better-known Drosophila melanogaster, the only other arthropod for which extensive population genomic information is available. They found some similarities: the two species have similar mutation rates, and based on long-term averages, both appear to have similar effective population sizes. This is surprising because Daphnia switches between clonal reproduction and sexual reproduction depending on environmental conditions, and Daphnia lives in lakes with little exchange between a population in one lake and a population in another, in contrast to Drosophila populations, which have no hard boundaries separating them. There were also differences between Drosophila and Daphnia—most strikingly, the efficiency of natural selection seems to be higher in Drosophila because, as their analysis shows, mutations in Daphnia are often less strongly opposed by purifying selection. There may be an ecological explanation for this: Daphnia and Drosophila develop differently and live in different environments, and notably, Daphnia, unlike Drosophila, is capable of resting as an egg for hundreds of years. But to find the mechanistic link between ecology and the evolution of genomes, more research on more species will have to be done. Lynch et al. also found that Daphnia exhibits high nucleotide diversity and that its genome is very close to being in Hardy-Weinberg equilibrium and that the Daphnia genome has apparently neutral sites, including in introns, that could be used as benchmarks in selection studies. Similar sites in Drosophila appear to be under selection and thus are more difficult to apply in the same way. Together, these investigations set the stage for new lines of research on evolutionary genomics in natural populations. Ye, Z.; Xu, S.; Spitze, K.; Asselman, J.; Jiang, X.; Ackerman, M.; Lopez, J.; Harker, B.; Raborn, R.; Thomas, W.; Ramsdell, J.; Pfrender, M.; Lynch, M. A New Reference Genome Assembly for the Microcrustacean Daphnia pulex. Lynch, M.; Gutenkunst, R.; Ackerman, M.; Spitze, K; Ye, Z.; Maruki, T.; Jia, Z. Population Genomics of Daphnia pulex. Ackerman, M.; Johri, P.; Spitze, K.; Xu, S.; Doak, T.; Young, K.; Lynch, M.
Estimating Seven Coefficients of Pairwise Relatedness Using Population-Genomic Data. Genotype Calling from Population-Genomic Sequencing Data.